The use of direct messages (SMS) has significantly dropped especially among most users today, but that is not to say that it’s no longer a viable option. Text messaging is something you can turn to if your recipient doesn’t use some of the other more popular apps like Whatsapp or Messenger. The biggest form of competition to it is the fact that these apps have a lower cost of use compared to direct messaging. They only require an Internet connection to work, plus the number of messages that you can send through them is virtually unlimited. These are probably two major reasons that have also contributed greatly to the rise in the use of TextNow. 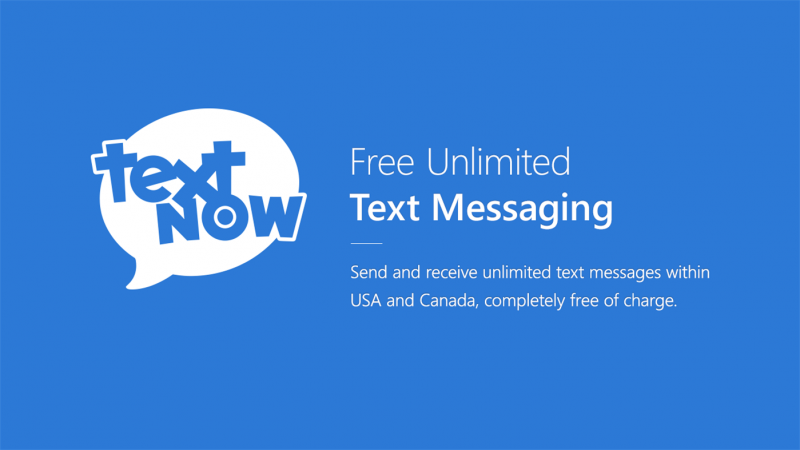 Like Messenger and Whatsapp, TextNow is an app that also allows for messaging courtesy of your Internet connection. On top of that, it also offers a paid for version dubbed TextNow Wireless that allows you to make both unlimited calls and texts. If you do choose to go for this service, you’ll get a free private phone number from which your calls and texts will be made or sent through. This can be very convenient especially if you’re in an area where there’s no broadband connection, and you’d wish to communicate with someone. Signing up for the service is also hassle-free, as all you’d need is either your email address or your Facebook account. The only issue that might stand in your way is the fact that the service is only available in the US and Canada. Connectivity and use are restricted to these two regions, but this doesn’t need to be the case. It is possible to use this service outside both Canada and the US, but only if you’re able to apply a solution that can hide your actual location. This is something you can do through a VPN. Download and install the VPN app on the device you wish to use TextNow on. Connect to a VPN server in USA or Canada. You will now appear to be browsing the web as if you were in the United States. Access TextNow from anywhere in the world. TextNow has also tried to maintain a level of privacy among its users since they offer you another number to use instead of your real one. A VPN service adds to all this by encrypting your online connection. Signing up with a VPN allows you to encrypt your traffic. You get to have complete security and anonymity from any third party that might want to track down your activity. You also get to bypass any network blocks that might’ve been put in place by your school or employer’s network. ExpressVPN starts off our list as the most well to do provider, having won awards numerous times for its excellent service. Based out of the British Virgin Islands, ExpressVPN oversees more than 2000 servers, distributed across more than 90 countries. The service applies military grade 256 bit AES encryption to keep you secure and well protected. It also allows for up to 3 simultaneous connections for users that have multiple devices. If the 3 aren’t enough, you can opt to download the VPN client directly onto your router to have even more devices protected. ExpressVPN offers stellar features such as split tunneling, an Internet kill switch, support for Tor over VPN as well as DNS leak protection. ExpressVPN users also get to choose from OpenVPN, SSTP, PPTP and L2TP/IPSec as VPN protocols they could use. ExpressVPN’s customer care team is also always at hand to cater to its subscriber’s needs. You can contact them through the live messaging service, email or even social media. For those based in heavily censored countries, ExpressVPN also offers a series of obfuscated servers that allow for the covert use of their service. To see what else ExpressVPN can do, have a look at out well put together ExpressVPN Review. Also making it to this list is IPVanish; a US-based provider that promises to effectively hide your real IP address. The service is based specifically in Florida, but it has its 1500+ servers scattered all around the world. The provider also happens to directly own all of them, so there shouldn’t be any worry about third-party interference. IPVanish also provides the industry standard of 256 bit AES encryption, though its support of up to 10 simultaneous connections sets it quite apart. The service is able to support all these added connections, and also allows users to choose between IKEv2, OpenVPN and L2TP/IPSec for their chosen VPN protocol. IPVanish promises both unlimited bandwidth and unlimited server switching capabilities, with special attention being given to users who intend to torrent. For this special group, IPVanish promises unlimited peer to peer file transfers, as well as complete anonymity. IPVanish also has a well to do Smart DNS service, which allows users to change their location by shifting through their many different locations. Collectively, IPVanish provides up to 40,000 IPs from its network of servers, meaning users shouldn’t have any issues finding which one to use. To get a better idea of what this provider offers, makes sure you get to look over our IPVanish Review. We wouldn’t be doing justice to this list if we failed to include one of the most trusted services in the industry. NordVPN has been around for close to a decade now, and in that period the service has developed features that have proved to be very essential for online security. From its base in Panama, the service controls close to 4400 servers, based in over 60 countries. The large number gives them a leverage to offer unique services such as DoubleVPN encryption. Users also get to decide which server to connect to based on the activity being carried out online. There are servers for gaming, streaming, bulk downloads as well as torrenting. NordVPN fully supports the use of the Tor network, and also offers software such as CyberSec and SmartPlay to make everything that much more convenient. NordVPN users will be able to benefit from the presence of dedicated IPs, as well as an Internet kill switch. Its 256 bit AES encryption goes without saying, and its ability to support up to 6 devices is a major plus. To find out what more you can get out of NordVPN, take a look at our NordVPN Review. A VPN or a Virtual Private Network allows you to hide your connection by camouflaging your Internet Protocol address. Your IP address basically is your digital fingerprint online. It happens to carry certain information about you and your connection. By identifying your IP, someone is able to find out your location, and sometimes, even your identity. A VPN allows you to hide all this by offering the opportunity to change your IP. This can be done by connecting to the Internet through a different server, instead of the one used by your ISP. Using a VPN also means that you’re able to avoid being monitored by your ISP. ISPs are known to implement certain measures that affect your connection. When they do this, it is known as throttling. A VPN helps you avoid all this, but for it to be effective, you need to ensure that you choose a worthwhile provider. We’re going to help you out with that. We’ve just gone through three top-tier VPN services that you could subscribe to, and get to have access to TextNow even when outside both Canada and the US. These VPN services are all top notch in their own different ways, and that’s why we recommend going through their individual reviews to know what to pick. If you have any questions or comments you’d like to share with us, leave them in the section below, and we’ll be glad to get back to you. Next articleVPN : 8 Tips to Get the Most Out Of Spotify You Don’t Want to Miss!